A passionate performer, Wangari infuses her stories with song, dance, chants and other performance delicacies to create an intimate interaction with her audiences. She has vast experience sharing stories to a variety of platforms in Kenya. She has toured India, Iran, Germany, Sweden, Tanzania and Somaliland telling stories and conducting workshops. 2013: Sigana International Storytelling Festival, Kenya & Storymoja Hay Festival, Kenya. 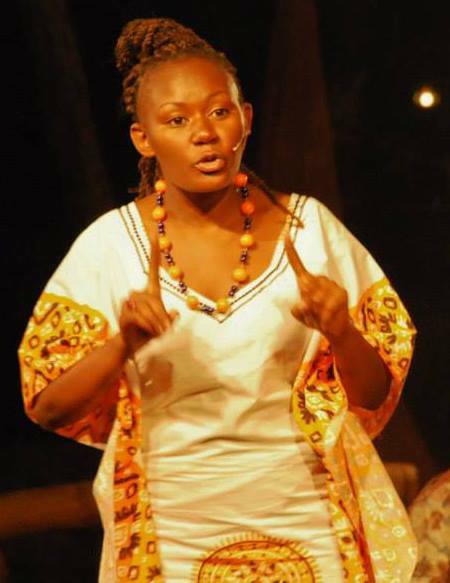 2012: Sigana International Storytelling Festival, Kenya & Storymoja Hay Festival, Kenya. 2010: Fabula Storytelling Festival, Sweden. She has also done storytelling for Television, both for children’s show (Jambo Toto – KBC TV) and general audience program (Sigana Motomoto, QTV). She champions reading for pleasure among children and young people, and has authored 3 children’s books: The Colour Magician, The Forever Tree and Mti wa Milele.